Aliens: Colonial Marines was launched back in Feb 2013 and got what you might call 'a bad press'. What should have been a sure-fire winner, given the genre and franchise, was not an attractive buy according to many reviews. A big problem was the Alien AI, with these deadly foes acting in a rather slapstick manner as they might "get stuck on the ceiling, fall off walls and run in circles," notes PC Gamer. While the questions of quality control and lack of a quick fix for this important playability issue remain, a ModDB user has uncovered a simple fix for the Alien AI problem. The Aliens play dumb simply due to a typo in one of the game's .ini files. The offending .ini files is supposed to initialise a function called 'AttachPawnToTether'. This would mean that the aliens would be smart enough to track the player, be hard to shake off, and do their aggressive best to kill you off. PC Gamer notes that after editing the problem .ini file the xenomorphs "waste less time getting to the player, crawl and lunge more often, and generally move in more of a beeline rather than their usual drunken stroll". Here is the original code: ClassRemapping=PecanGame.PecanSeqAct_AttachXenoToTether -> PecanGame.PecanSeqAct_AttachPawnToTeather. Here is the fixed code: ClassRemapping=PecanGame.PecanSeqAct_AttachXenoToTether -> PecanGame.PecanSeqAct_AttachPawnToTether. In the ModDB post by James Dickinson, it is noted that "AttachPawnToTether does ALOT. It controls tactical position adjustment, patrolling and target zoning". In his opinion, from looking at the code and behaviour of Aliens, "When a Xeno is spawned, it is attached to a zone tether. This zone tells the Xeno what area is its fighting space and where different exits are. In Combat, a Xeno will be forced to switch to a new tether (such as one behind you) so as to flank, or disperse so they aren't so grouped up etc." 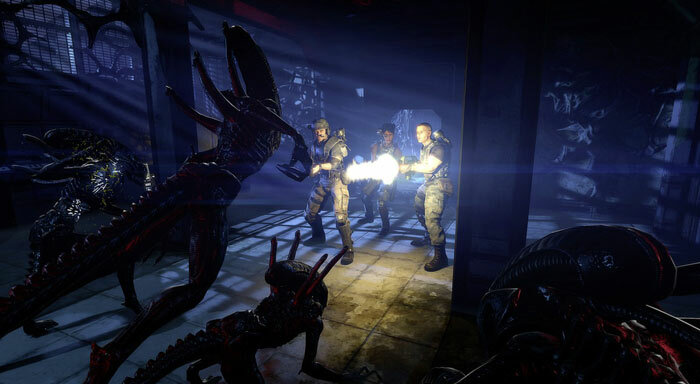 If you have Aliens: Colonial Marines in your games library, this edit might be worth a try. If the idea of the game in a more playable and challenging form appeals then it is now possible to pick up a copy of the title plus its DLC for as little as $2.79 or £2.49 (via Fanatical). I'll have to check this out when I get home. Why would they even make that relationship value a userspace .ini configurable in the first place? That's crazy. This should forever be documented in college and university courses to show how powerful something as simple as a typo within code can be. One extra letter in the wrong place has literally tarnished this game forever. I feel really bad for them now actually. I feel really bad for them now actually. This is a shining example of whats wrong with the industry currently. Point one I do agree with, it shouldn't have passed release, but the issue was obviously unseen and considered to be non-existent before it appeared on shelves. The second point depends, sometimes when you run across an issue like this you will be diving deep into all kinds of reasons why the AI isn't functioning correctly on a technical level, not thinking it would be a simple typo in an .ini file, especially if the AI was working fine in-house before release. You are completely right, but I can have empathy towards how this would have happened, and the reality is, it is one single person making one simple typing mistake that has ruined the reputation of many good intentioned workers, and that is why I feel bad for them. I am not excusing them, just explaining why I feel this way whether right or wrong.